EU - Consumer demand for pig meat in key EU markets has remained under pressure in 2016, with consumption generally falling back in spite of favourable prices. This, in turn, contributed to the low pig prices throughout the EU earlier in the year. Such developments apply to the key markets of Germany, France and Italy, for which consumer panel data is available. This has also been similar to developments in the UK, even though retail price falls have been less marked on the continent. For fresh pork, the summer barbecue season in northern Europe got off to a slow start, despite the European football championships, but, as the weather improved, demand for grilling cuts subsequently rose. In Germany, the largest market in the EU, household purchases by volume of fresh pork were down by nearly 5 per cent. The 1 per cent price fall did little to improve the situation, which meant that spending was down by as much as 6 per cent. Demand for grilling cuts over this period was affected by the poor weather, although as the summer weather picked up, it is understood to have improved. The demand for ground meat, traditionally consisting of a mixture of pork and beef, held up in January-June, being 1 per cent more by volume, while purchases of charcuterie were down by 1 per cent. Pig meat has historically been the pillar of meat consumption by German consumers but demand has been falling back steadily during the current decade, with changing lifestyles and purchasing habits. This in turn has contributed to a decline in total meat purchases, in spite of the ongoing switch to poultry meat. 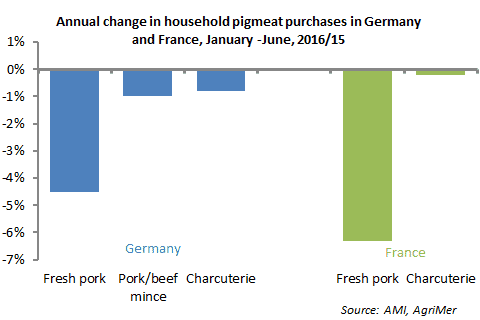 In France, household purchases of fresh pork have fallen by a similar amount to those of Germany in the first six months of 2016, being down 6 per cent, although there was a marginal improvement in the demand situation over the summer. Demand for charcuterie has held up better, with household purchases largely unchanged, despite a fall of almost 2 per cent for ham. The market has remained under pressure in Italy in 2016, with fresh pork household purchases down 6 per cent in the first quarter, which followed on from the decline of 8 per cent in 2015. Purchases of processed products, including salami and ham, have also been well down so far this year.